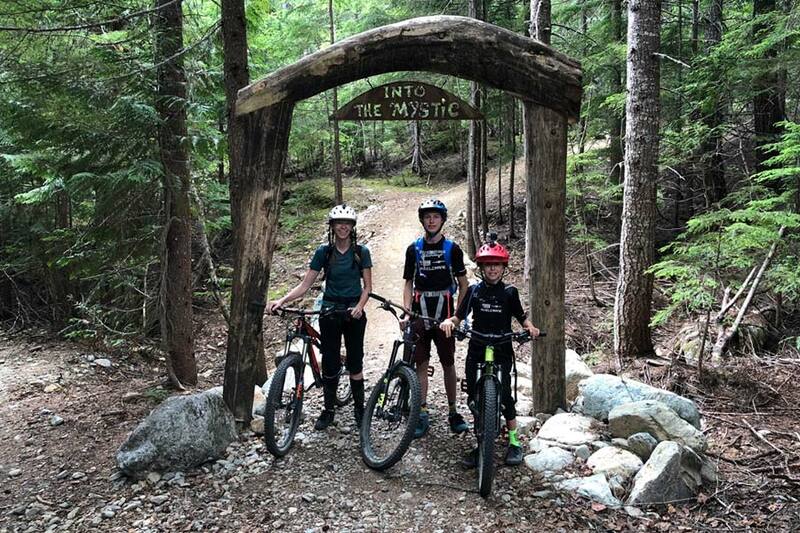 From the instant I heard about the new trails Into The Mystic, On The Rocks, and Lord Of The Squirrels – I kind of obsessed over riding them this summer with my wife and kids. 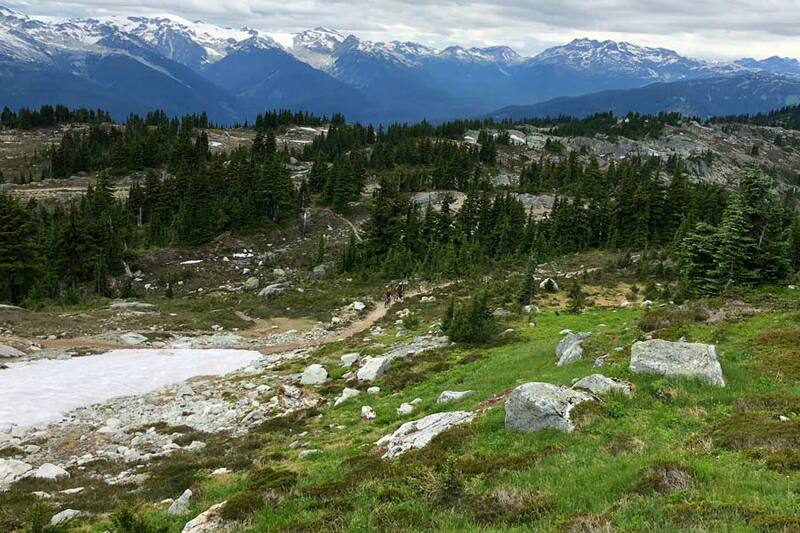 The trails opened near the end of summer 2017 and they showed off a part of Whistler we have not seen before. Some trails were well established in the lower Mt. 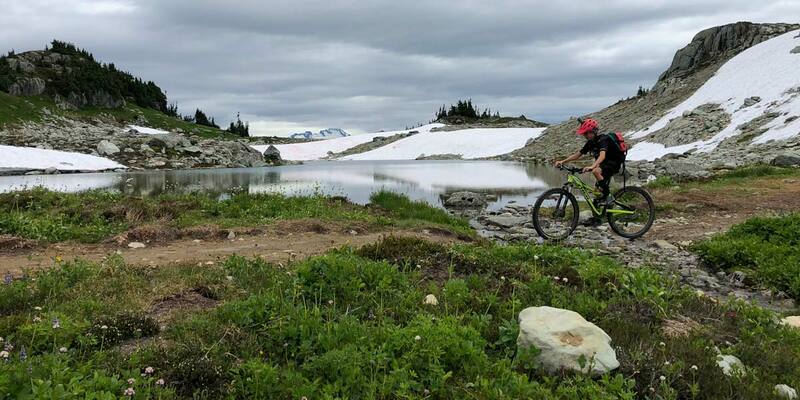 Sproatt area, but this ride takes you up through the forest and almost above treeline. 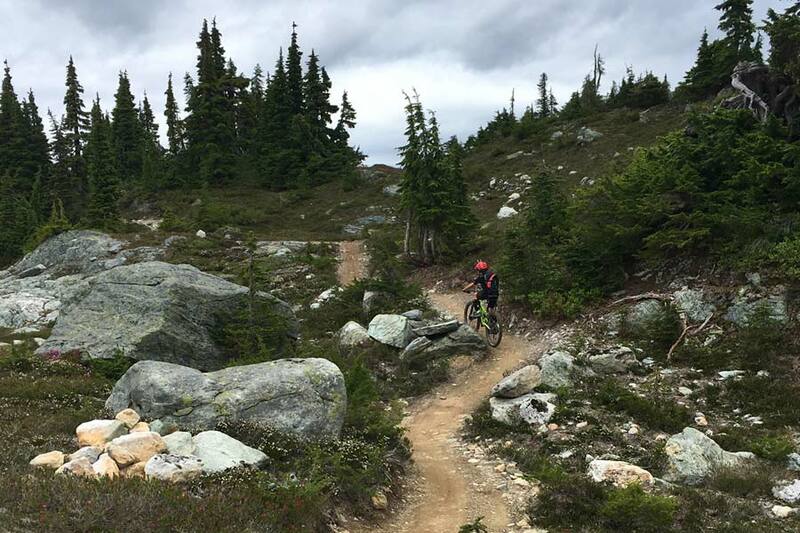 The trails were built by WORCA (Whistler Off Road Cycling Association) with support from the Resort Municipality of Whistler. Another organization, the Trails Planning Working Group, is municipal committee designed to bring all the collaborators together. Dan Raymond was hired to be the project manager for the Lord Of The Squirrels. This is not your typical family bike ride. It is in the wilderness and climbs on Into The Mystic and On The Rocks are strenuous. Depending on where you start this ride, the elevation gain is significant. We started pedaling from our condo at we ascended about 3,500 feet! When you do this ride with your kids, it’s important to be aware of your capabilities. Our youngest is 11 years old and already great on the pedals. But in order to ensure his enjoyment and success on Into The Mystic, we did a few training rides in Park City before we left on our trip. We knew what type of food to bring as well as how much. We all filled our hydration packs to capacity and made sure our bikes were in good condition. Just to be safe, in addition to the basics, I brought along an extra derailleur cable, spare tubes and and extra battery with an additional SD card for the action camera. My wife brought along an extra USB battery pack if a phone ran out of juice. We were dressed in appropriate clothing and to make sure it did not rain – we packed light rain jackets. 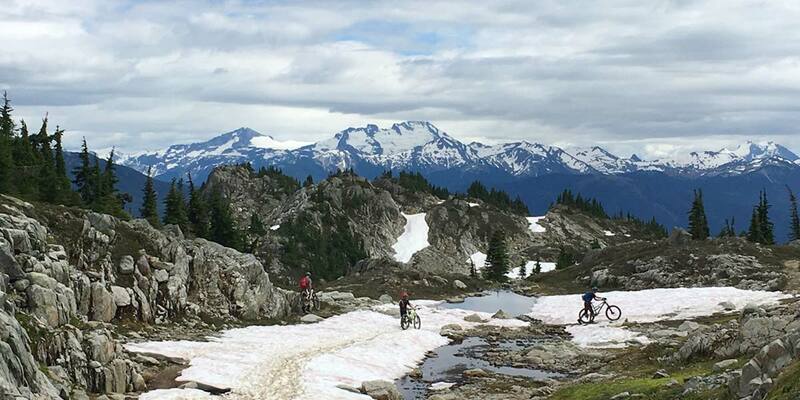 Bring plenty of food and water for this epic mountain bike ride. We were keen to pack rain jackets and check the weather. Take a minute and donate to WORCA right now. 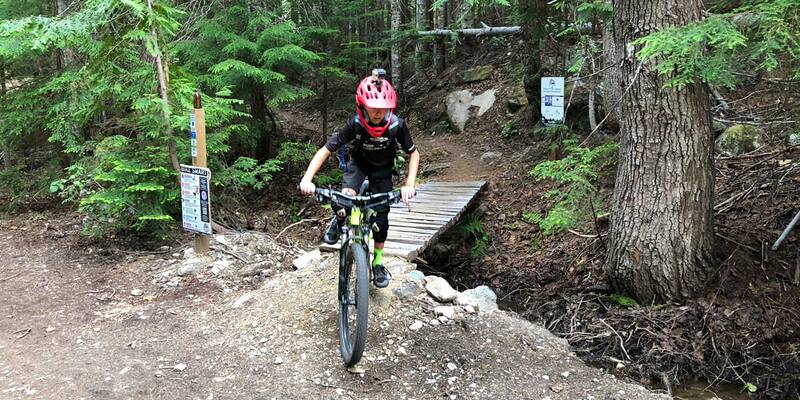 They are one of the groups responsible for making trails like this happen. And, because of contributions from families like yours and mine, WORCA can build more trails so families can make more memories and enjoy the outdoors together. The beginning of this trail welcomes you with a marquis constructed from logs and a steel plate sign with the name of the trail cut from it. It’s like you’re at the start of a life-sized board game or a ride at an amusement park. Pedaling starts off easy enough, but you’re soon ascending along one of the most beautifully crafted climb trails in middle earth. Fit riders will make easy work of this in a couple of hours or so. The trail is not a bunched up string of switchbacks and that makes it a pleasure to climb. We saw a kid who was similar age to our 11 year old on this trail pedaling with his dad. He was crushing the climb and we did not catch them. About two-thirds of the way up on Into The Mystic you come across a platform with benches and railing adjacent to a creek down a small canyon path. Chains have been bolted in the rock so you can make your way down to a creek in the canyon. The kids went down for an explore and to see if they could catch a chat with Gollum. We took a long break here so we could rest and refuel. Three of us had to do plenty of resting and hike-a-bike on Into The Mystice, while our oldest son pedaled the entire trail. When you’re near the end of Into The Mystic, the trees become sparse. You start to notice more rocks, small grounds of grass and more open space. You are on the edge of the tree line and the environment is quite is over-the-top. Vivid wildflowers, exposed rock and a palette of greenery complement your immediate surroundings. I think it’s similar to when a PNW native sees Moab in-person for the first time. Off to the distance you can see several other peaks adorned with snow and glaciers. 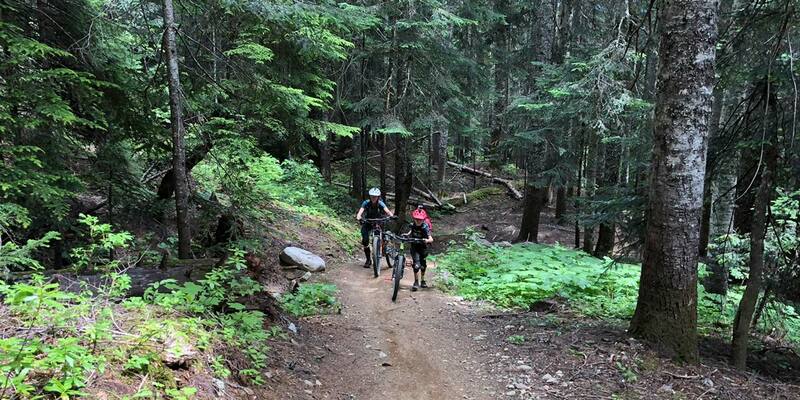 The start of this trail is more climbing, but once you reach about 5,900 feet – most of the hard pedaling is over. Our youngest took a few rests on the first part of this trail. Good thing – because I certainly needed the breaks as well. 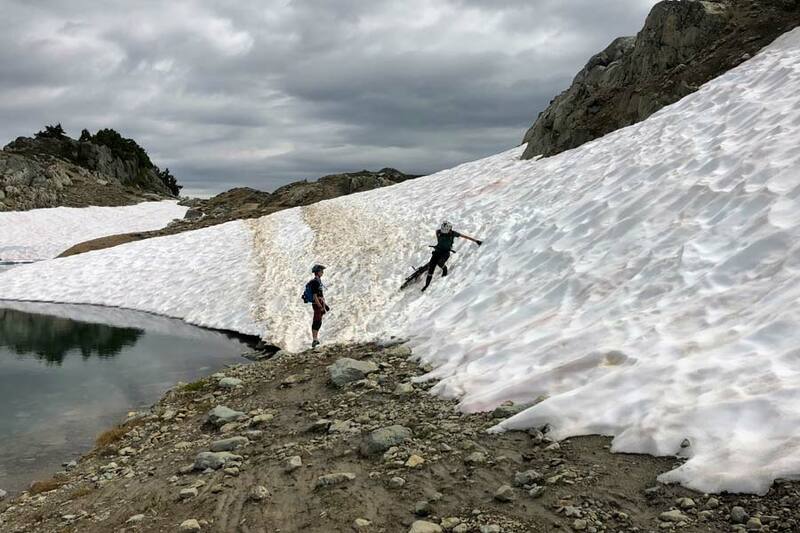 Once you start descending On The Rocks, you may encounter snow fields you will have to ride through or ferry your bike across. All four in the family ended up with wet feet and squeaky brakes. Overall, I think we encountered a total of 10 areas where the trail was snow covered. This was a fair trade-off because the trail had only been opened for two days and we were due to leave town in the morning. 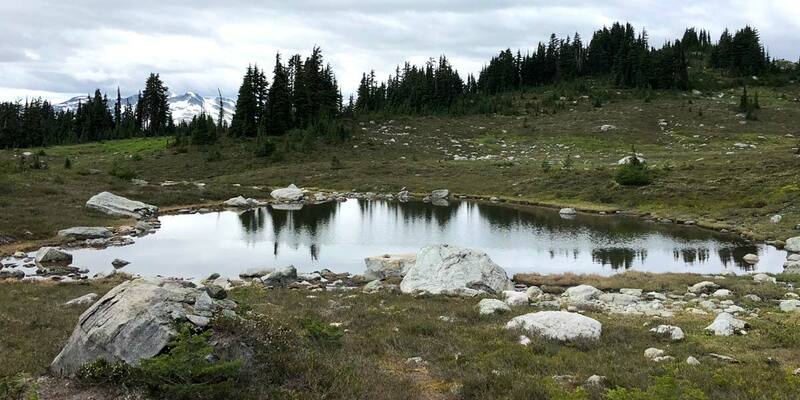 There are also several small ponds and basins filled with runoff. I don’t know how many of these qualify as lakes, but they are one of the highlights of the ride. It took us a whopping six hours to get to the Lord Of The Squirrels trailhead from our condo. Please take this into consideration if you are planning on doing this ride with your kids. 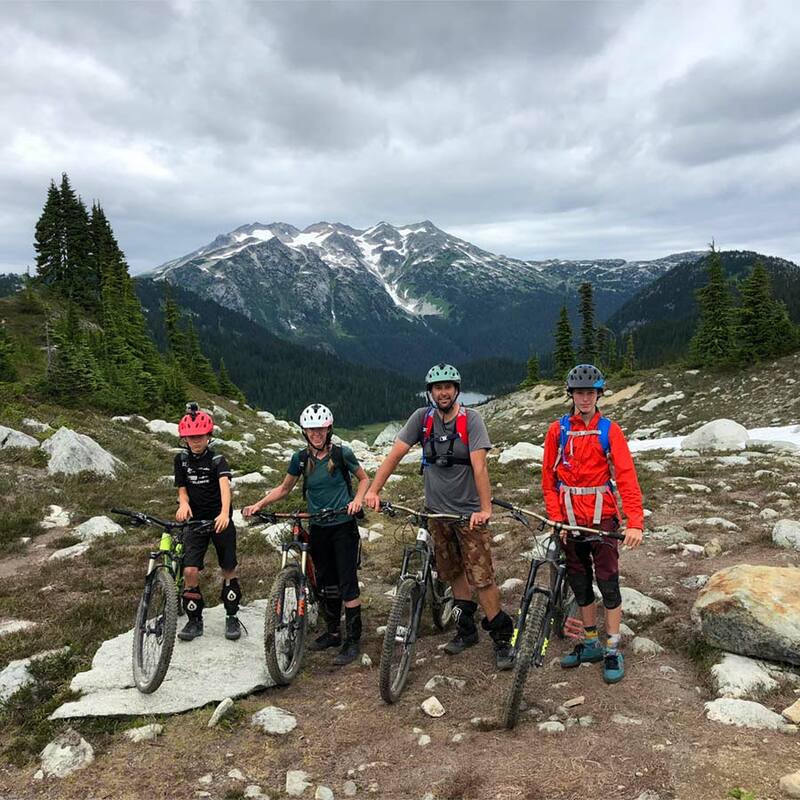 With the exception of our 15 year old, who can be considered an expert mountain biker, I think the rest of us are intermediate to strong intermediate mountain bikers regarding fitness, skill and and mettle. And it must be said that if my wife had her way – we would only ride uphill. We took it real slow the entire day by taking too many breaks to count, gigs of photos and made sure no one got hangry. After getting through the last couple of snow fields, Lord Of The Squirrels is a downhill romp through the woods. It’s very enjoyable because after we encountered about 6 other riders on the trail – it was all ours. We were expecting a lot more people due to the recent opening. The trail is aptly rated as intermediate so no one had to get off the pedals and walk the rock rolls, roots, bridges and tech sections. 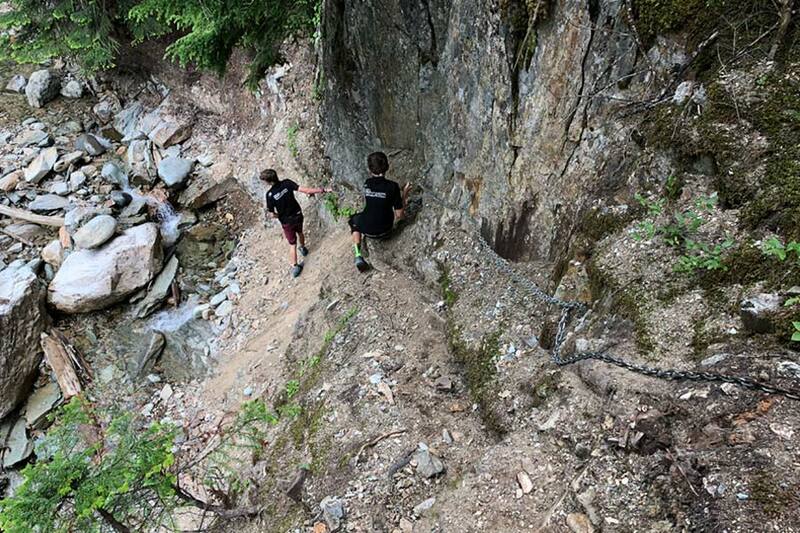 All of the trails features were enjoyed by the family from top-to-bottom. The trail is only over a year old. The dirt has not settled. The roots are still raw and untidy. 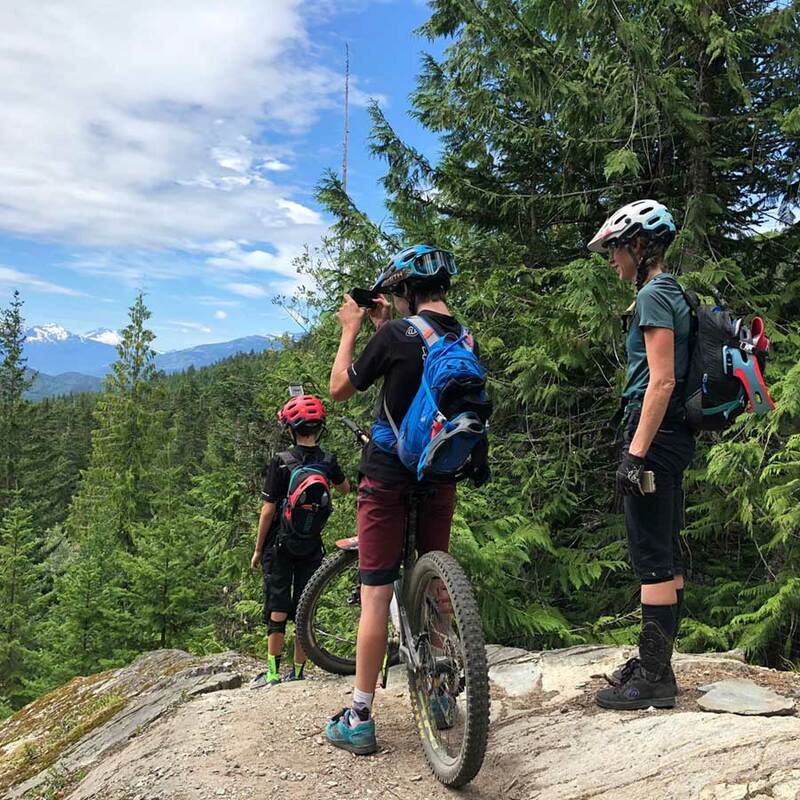 If you have experienced new trail in this region, you know the sound your tires make – and the density of the trail surface. It’s a lot of fun. Exiting the trail, you’re back near the start of Into The Mystic. Depending on where you started from, you may have a bit of ride to get to home base. On the way back our 15 year old was not done. He broke off for a bit to give Cheap Thrills a whirl. This ride is beautiful. I hope I have the opportunity to compare it to others around the world while riding with my family. For me, it was hard and you have to work for it. That helps keep it sustainable and special. 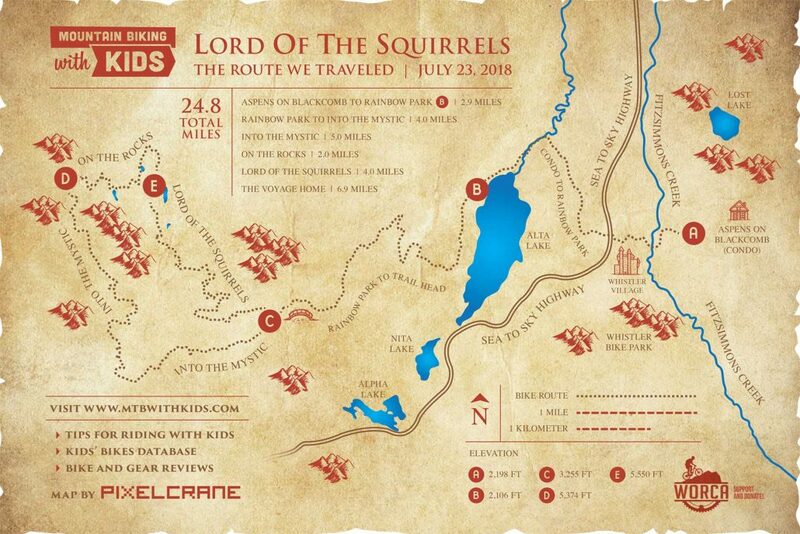 The bike park is awesome, but Lord Of The Squirrels is just a different kind of awesome on the other side of town. When your heart is pumping and your legs don’t want to climb anymore, you just look around at where you are and take it in.